FIBA Asia Championship 2015 Quarterfinals / Knockout Round Gilas Pilipinas Schedule of Games: Take a look! 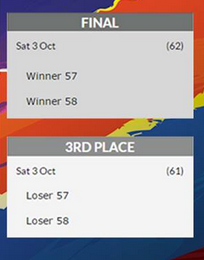 After beating Iran the other day in the 2nd round to finish at the top of group E, Gilas Pilipinas gets a safer path to the much coveted FIBA Asia Championship 2015 Gold Medal round. 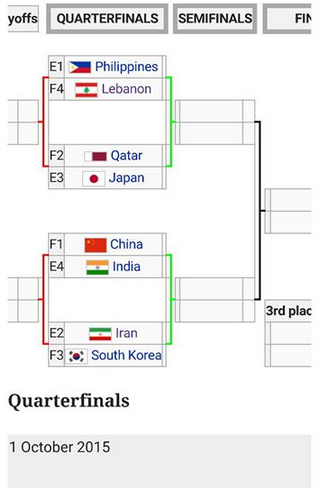 As we can see in the quarterfinals/knockout round bracket below, the Philippines was able to avoid a possible semifinal showdown against one of the three tournament favorites, China,South Korea, and Iran (These 3 teams are on the other side of the quarterfinals bracket). But before anything else, the Nationals should first get rid of Lebanon on Thursday (tomorrow).